Acadian Genealogy Homepage; Acadian Surnames (Hache-Gallant to Knight)! 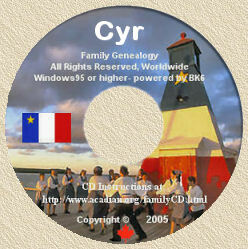 "In Search of Our Acadian Roots; ©1994 to current date"
"Acadian-Cajun Family Trees; ©1999 to current date"
Note: I've only included those surnames which appear a minimum 50 times on the CD's. Note: I've only included those surnames which appear a minimu 50 times on the CD's. Click here to view surnames on the CD's starting with the letters "A and B"
Click here to view surnames on the CD's starting with the letter "C"
Click here to view surnames on the CD's starting with the letter"D"
Click here to view surnames on the CD's starting with the letters"E, F, and G"
Click here to view surnames on the CD's starting with the letters "L and M"
Click here to view surnames on the CD's starting with the letters "N, O, P and Q"
Click here to view surnames on the CD's starting with the letters "R, S and T"
Click here to view surnames on the CD's starting with the letters "U, V, W, X, Y, and Z"